The Withings Move shouldn't be overlooked for those considering a cheap fitness tracker. I love the way it looks, and since it's so customizable there's a good chance you will too. It doesn't feel like I'm wearing a fitness device when I put on the Move. It feels like I'm putting on a watch — my watch — and only I know it's actually much more than that. With that said, there are more powerful devices out there. If you're in need of a heart rate sensor or built-in GPS, look elsewhere. What comes to mind when you think of the term fitness tracker? Most likely, it’s a silicone band that may or may not have a display, and it’s probably not all that attractive to wear at all times. Withings has always had a different approach to fitness trackers. Its latest watches — the Withings Move and Withings Move ECG — hold to the idea that not all fitness wearables have to come in one form factor. Both of these new devices look like regular ol’ analog watches, but they’re much more than that. 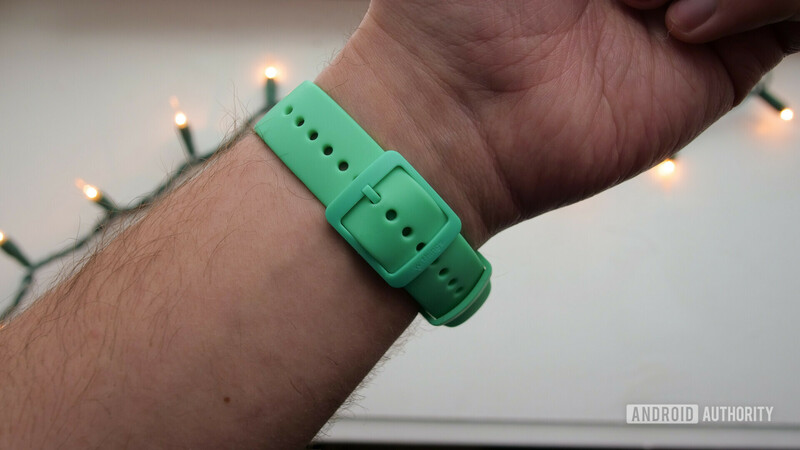 Read our Withings Move review to find out why I’m not taking it off my wrist any time soon. Withings Move review notes: I’ve been using the Withings Move (non-ECG model) for roughly two weeks. It’s been paired with my Google Pixel 3 for the duration of this review. As helpful as fitness trackers can be, they’re not particularly attractive. Many of them look like rubbery bracelets. That’s fine for some people, but I’d rather wear something that looks good at all times, not just when I’m at the gym. The Withings Move doesn’t look anything like a traditional fitness tracker — it’s first and foremost an analog watch and also has some fitness features built in. 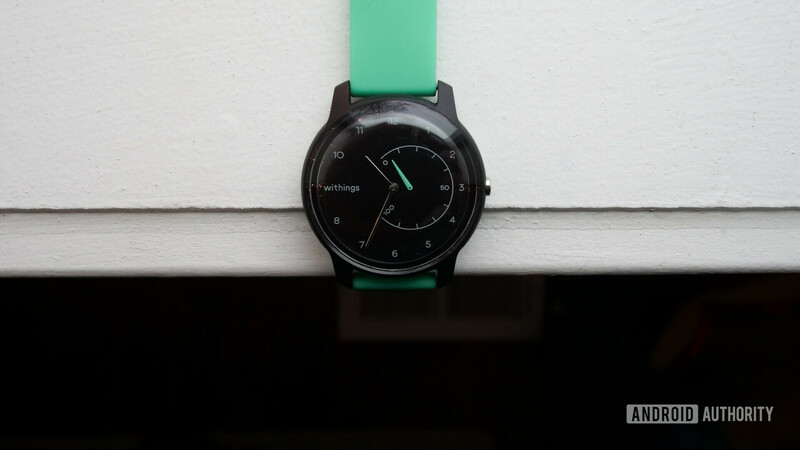 The Move exudes the playful design language we’ve grown to love over the years from Withings. The colorful bands and round font give the watch a sense of personality you won’t find in many other watches. It’s made almost entirely of plastic, but it doesn’t really feel cheap. The only downside to the all-plastic casing is that it isn’t the most durable material out there. The transparent piece of plastic protecting the watch face (usually referred to as “watch glass”) scuffs pretty easily. After just a few days of wear, it managed to accumulate a handful of scuffs after I knocked it against a door a few times. If you wear it every day for tracking your fitness, it likely won’t stay scratch-free for too long. Some might be able to look past those durability issues though, because this watch is completely customizable. If you order from Withings.com, you can choose your own dial color, case color, activity hand color, and strap color — all free of charge. I wish more companies did this. Similar to how Moto Maker operated, Withings will fulfill all U.S. orders right here in the U.S., so you shouldn’t have to wait long between your order date and ship date. All non-U.S. orders will be fulfilled in Europe. The customization options are only for the standard Move though. Since the Withings Move ECG needs to be approved by the FDA before coming to market, Withings only offers the pricier watch in limited color options. The Move is one of the few fitness trackers out there that doesn’t need to be charged. It runs on a CR2430 button-cell battery, which you’ll need to replace after about 18 months. Obviously I haven’t been able to test whether or not it can actually last that long, so we’ll have to take Withings’ word for it. I ran into a slight issue a few days into my testing, though I’m not sure if it was battery related. I woke up one morning and noticed the watch stopped working at 5:30 a.m. I couldn’t get it to turn on again (I pressed the side button repeatedly every few hours) until about 3:30 that afternoon when it magically sprung back to life. It’s an odd problem, since the watch is effectively always on, so for some reason it just stopped working for that period of time. Withings has been notified about the issue and is looking into it. I’m not reviewing a retail model, so it’s possible devices purchased from Withings’ website won’t have this issue at all. The Withings Move isn’t trying to be the most feature-packed fitness tracker, and that will probably turn some people away from it. It can keep track of basic things like steps taken, calories burned, and sleep, as well as distance traveled and elevation if you use the connected GPS feature. Frankly I’m surprised connected GPS support is here — the Withings Move doesn’t even have a heart rate sensor, which is pretty standard in fitness trackers nowadays. Sure, wrist-based ones aren’t always the most accurate, but they help users form a more well-rounded view of health and sleep metrics. Withings had to make some sacrifices for a device that costs under $70 and has 18-month battery life. Withings’ General Manager Mathieu Letombe told Android Authority adding a heart rate sensor would not only make for a thicker device, but also increase cost and decrease battery life. I suppose keeping the watch at a price this low took some sacrifices. Despite the Move being one of the simpler fitness trackers on the market, it can track a pretty wide variety of sport profiles. It will automatically track walking, running, swimming (the Move is rated to 5ATM), and biking, but you can also record over 30 miscellaneous activities like dancing, hiking, weight lifting, and yoga. The lack of a treadmill workout option is puzzling, but I guess you can always record that in the catch-all “other” category. It’s hard to tell if activity trackers are accurately recording your calories burned or steps taken, but the Withings Move seems to be in the same ballpark as other devices like the Fitbit Charge 3 and Garmin Vivosport. I found sleep tracking was hit or miss. On a few nights, the Move couldn’t accurately record when I fell asleep or woke up. In the screenshot below, you’ll see the watch recorded me falling asleep at 11:21 p.m., though it was actually right at 11 when I fell asleep. I woke up at around 6:30 a.m. that next morning, but the Move said I woke up at 5:28 a.m. I also felt like I had a good sleep that night even though the Move told me my sleep quality was bad. Most nights, sleep tracking is spot on. Below you’ll find the Withings Move’s sleep tracking compared to the Fitbit Charge 3’s. Note that the Move doesn’t account for REM sleep, though. Sleep duration aside, the Withings Move is a pretty insightful sleep tracker. The most useful metric is Withings’ Sleep Score feature, which is similar to Fitbit’s feature of the same name. The fitness tracker rates your quality of sleep, duration, regularity, and number of interruptions, and combines all of those ratings to give you an overall sleep score between zero and 100. I’ve found it quite helpful, aside from the occasional variation in sleep quality — some days I wake up and feel like I had a great sleep, even though the Move doesn’t agree with me. The Move will also display your sleep statistics in day, week, and month views so you can see how your sleep quality is progressing over time. 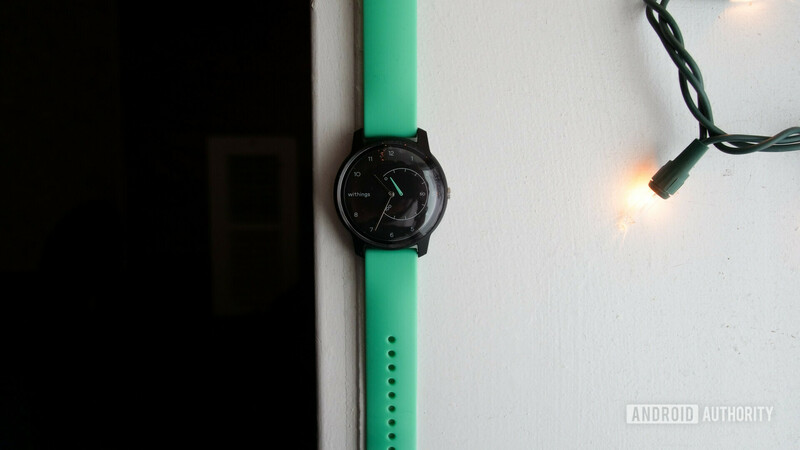 Other analog watch-fitness trackers offer at least some smartwatch features, but the Withings Move does not. You won’t receive a buzz on your wrist when your smartphone gets a notification, and you can’t set shortcuts to different actions like any of Fossil’s hybrid watches. It has a silent alarm feature, though. I would have liked to see support for phone notifications here. It’s a feature many people value in their wearables, and frankly it’s now nearly standard on fitness trackers. Not everyone needs notifications on their wrists, but it wouldn’t hurt to at least give users the option to turn them on. The company says offering smartphone notification support is not a focus for either the Move or Move ECG, but it will keep us updated if anything changes. Withings’ Health Mate app is clean and simple. Frankly it’s been a joy to use over the past few weeks. It all starts with Timeline, the section you see when you first boot up the app. It’s a bit simpler than Garmin’s My Day view, and gives you a better view of your activity over time than Fitbit’s Dashboard view. In the Timeline, you’ll see your daily steps, sleep, and basically every other activity stat the app records. You can also keep scrolling down to see activity metrics from previous days. The Dashboard section is simple. This is where you’ll see your most recent metrics on steps taken, sleep, weight measurements, heart rate, calorie burn, and more. Additionally, you can manually record your weight, activity, heart rate (using your phone’s camera and LED), blood pressure, and nutrition from both the Dashboard and Timeline views. Health Mate doesn’t actually have meal tracking built in, so you’ll be prompted to download MyFitnessPal if you want to record your food and beverage intake. 15 best Android fitness apps for Android (updated 2019)! Health Mate also offers a number of programs to help you dig deeper into your health. 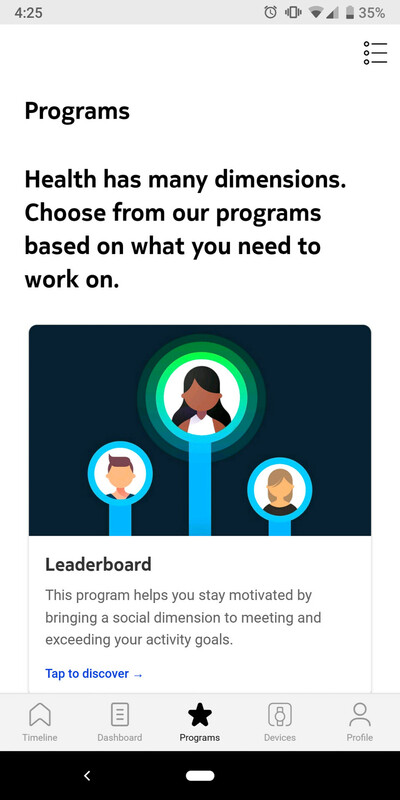 You can join a leaderboard and challenge your Withings product-owning friends, though this ecosystem isn’t nearly as robust as the Fitbit Community. It should be just fine for the casual user, though. There’s even a built-in pregnancy tracker to give women health advice and an easy way to track their weight throughout their pregnancy. If you’re already invested in a health app and aren’t keen on switching to Health Mate, a limited number of third-party services are compatible with Withings’ app. You can connect your account to Google Fit, RunKeeper, MyFitnessPal, and Samsung Health if you prefer to use those services instead. Health Mate can also hook up to IFTTT and Nest if you want to, say, turn on your lights when the watch senses you’ve woken up. The Withings Move shouldn’t be overlooked for those considering a cheap fitness tracker. I love the way it looks, and since it’s so customizable there’s a good chance you will too. It gets out of your way as much as possible, and I think that’s important. It doesn’t feel like I’m wearing a fitness device when I put on the Move. It feels like I’m putting on a watch — my watch — and only I know it’s actually much more than that. The Withings Move tries to get out of your way as much as possible, and that shouldn't be overlooked. If you’re a runner or someone who needs more advanced features like a heart rate monitor or built-in GPS, you’ve probably already realized this device isn’t for you. If you simply want to track your daily activity and health, I don’t think you can go wrong with the Withings Move. However, there are a few other cheap fitness trackers out there worth considering if you need something with a different set of features. The Xiaomi Mi Band 3 is crazy cheap at around $30. The Garmin Vivofit 4 and Fitbit Flex 2 are also worth considering. If you don’t mind spending a little more, you might want to check out the Fitbit Charge 3, too. It has many more sensors baked in and gives you smartphone notifications. If you’re interested, the Withings Move is available on Amazon and Withings.com for $69.95, but you’ll only be able to customize it on Withings’ site. Also, stay tuned for our full Withings Move ECG review if the idea of having an electrocardiogram strapped to your wrist interests you. Next: Fitbit vs Garmin: Which ecosystem is right for you?